As a result of the occupation many products were in short supply during the war. For example, more and more often bread and coffee missed for breakfast. A view of the Theresiastraat (approx. 1943). 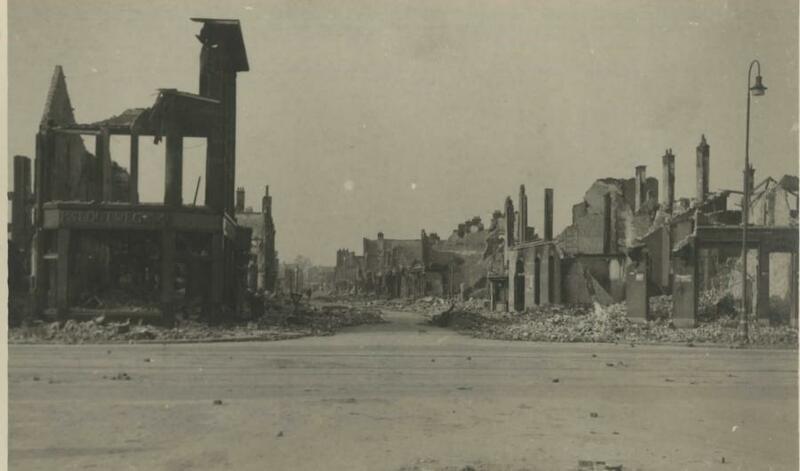 A view of the Theresiastraat after the bombing. A view of the Laan van Nieuw Oost-Indië looking towards the Juliana van Stolberglaan (approx. 1928). 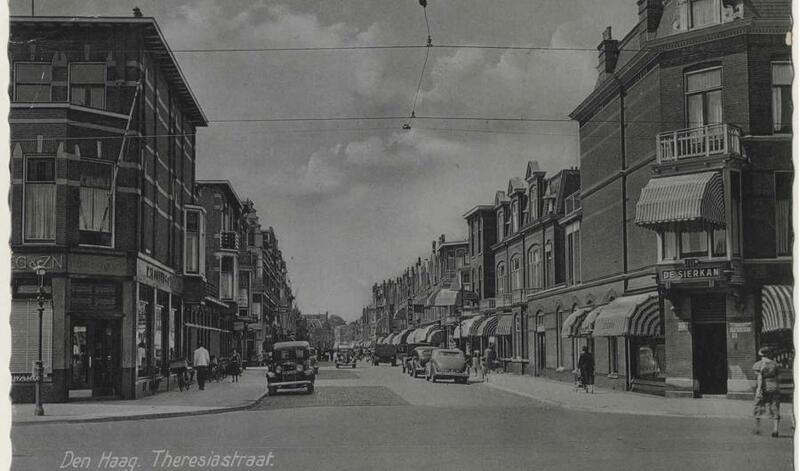 The Theresiastraat was a busy shopping street even before the war. 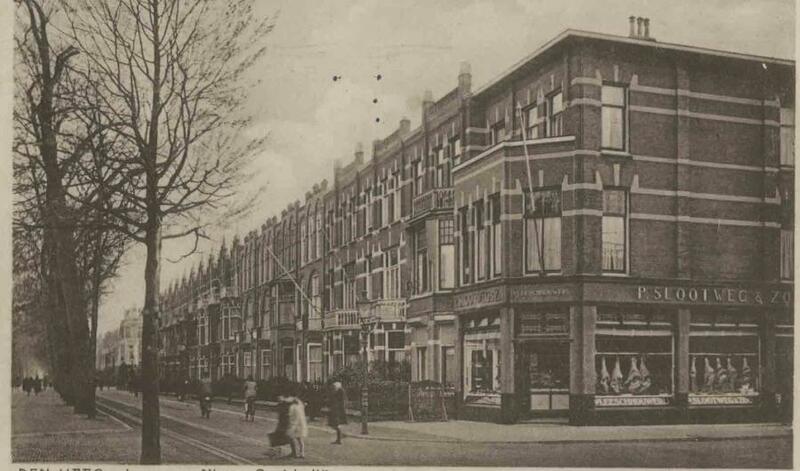 It included the well-known butcher P. Slootweg & Zn and at the opposite of the street The Hague dairy 'De Sierkan'. 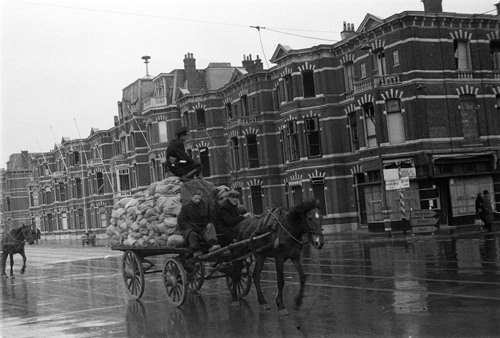 The residents of Bezuidenhout felt the effects of the occupation right from the start of the war. There were restrictions on the distribution of produce such as meat, milk, textiles, soap, bread, flour, coffee and tea, to ensure everyone received their fair share. They could only be purchased with coupons. More and more items were subject to rationing. Substitutes came to the market for all kind of products, from Ersatz coffee to preparations that could double the quantity of butter. The shortage of textiles was resolved by reusing and endlessly repairing existing clothes. 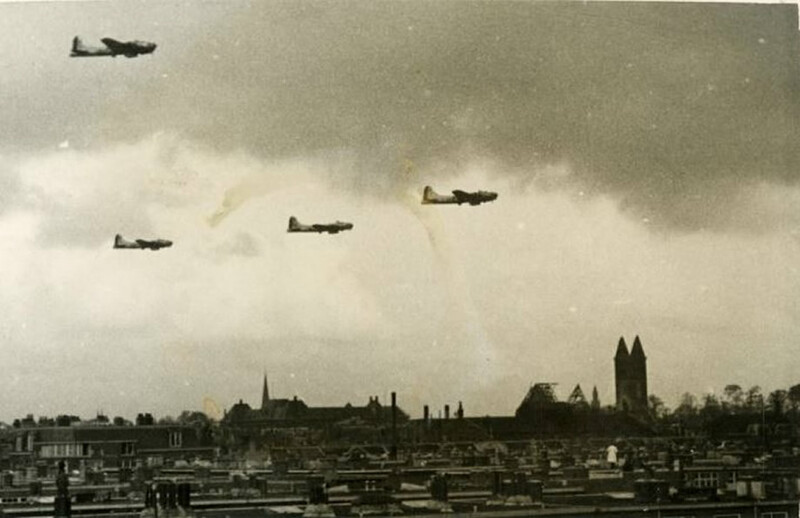 The Laan van Nieuw Oost-Indië more or less formed the north-eastern border of the bombed area. 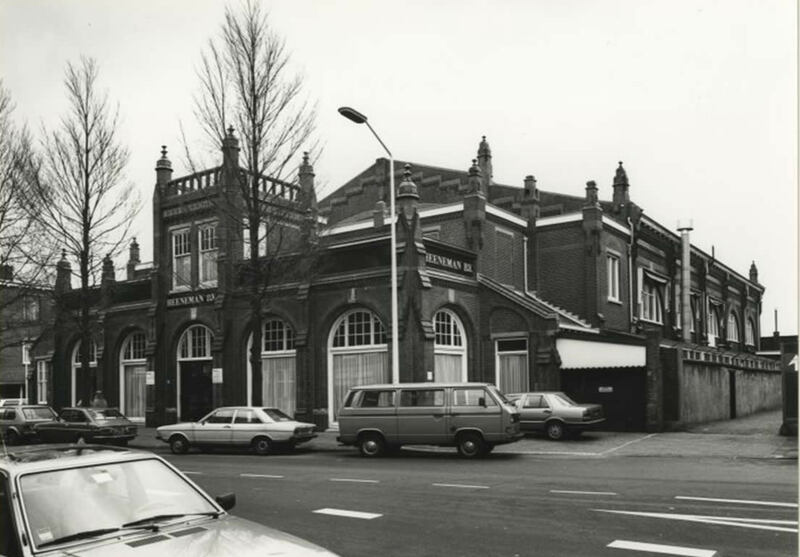 However a few other streets were also hit near the Spaarwaterlaan, opposite the current location of the library Haagse Hout. The row of houses at the Juliana van Stolberglaan were almost entirely destroyed. The current buildings were constructed in stages. 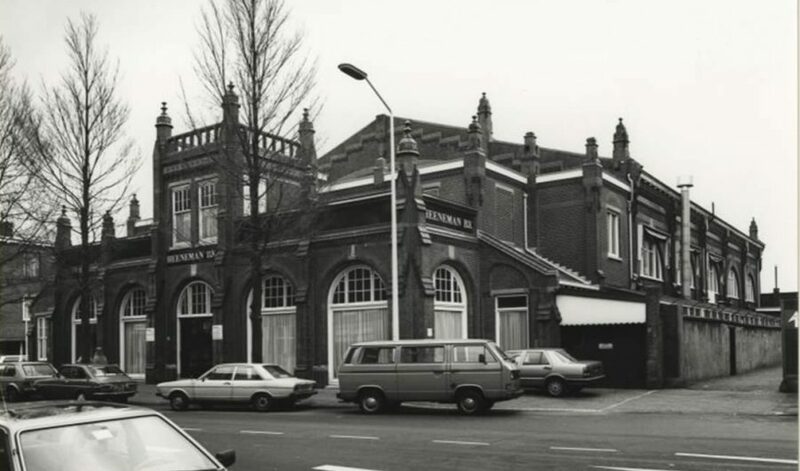 The shops on the opposite side of the Laan van Nieuw Oost-Indië were completed in 1953 and the block of shops and offices at the intersection was completed in 1969. 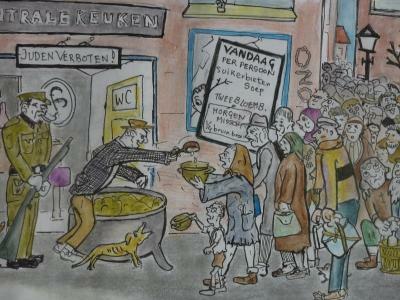 Adapted from an eyewitness account by P. Verreck, who was 15 years old at the time of the bombing. 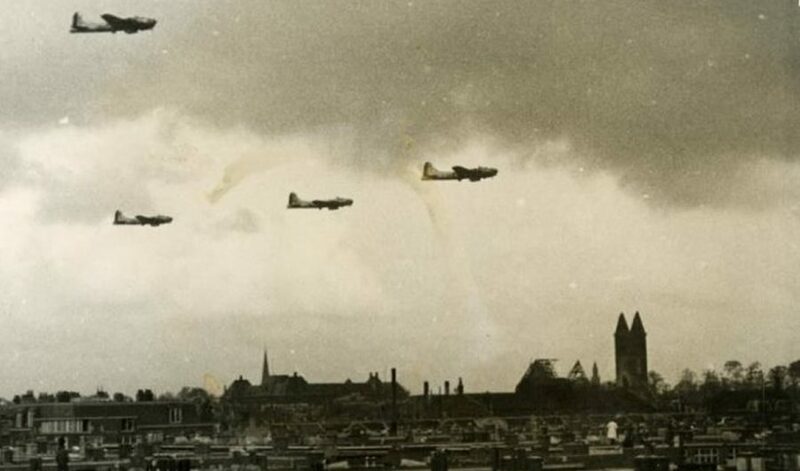 At the end of the war the German army allowed food droppings by planes in this area. 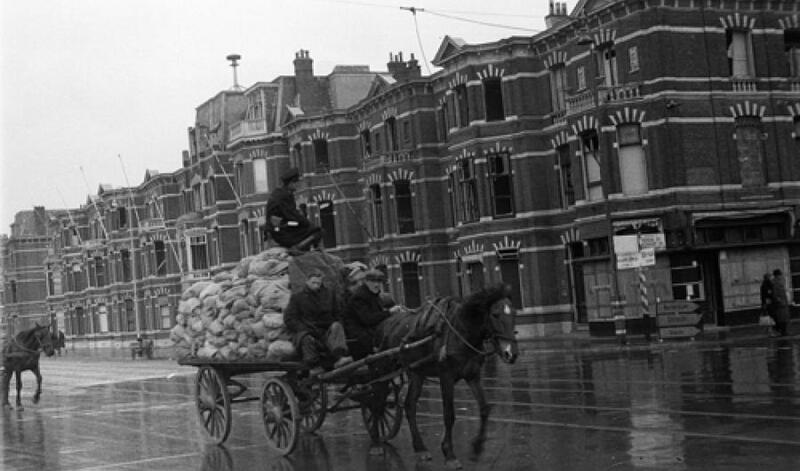 A food truck moved by horse and wagon passing the Laan van Nieuw Oost-Indië. Photo: Ed van Wijk. A sport building across the street. This sport building (just 100 meters ahead) erected in 1895, survived the bombing.